The Bodmin & Wenford Railway’s (BWR) GWR prairie No. 5552 has been reunited with its smokebox numberplate that was lost during a 25-year period in Barry scrapyard. The 1928-built locomotive was withdrawn from Truro shed in Cornwall in 1961, and ended up at Dai Woodham’s scrapyard in Barry. It languished until 1986 when it was acquired by the nascent BWR. Many essential pieces of machinery were missing, including its smokebox numberplate. After a lengthy restoration it was returned to service in 2003, and is currently undergoing a routine overhaul in the Bodmin General workshops. A family from Newport recently contacted the railway to say they had the original numberplate, and would like to donate it to the BWR. Chris Deakin, a BR signalman in Cwmbran in the 1950s, moved to Newport with his wife Marion. They visited Barry scrapyard in the 60s and Chris acquired various railway artefacts there. Chris died four years ago, and only recently did the family discover the original No. 5552 numberplate in Marion’s garage. On September 23, Marion and family members travelled to Cornwall to present the BWR with the numberplate. A brief ceremony was organised, and Marion and her family were given a steam train ride. 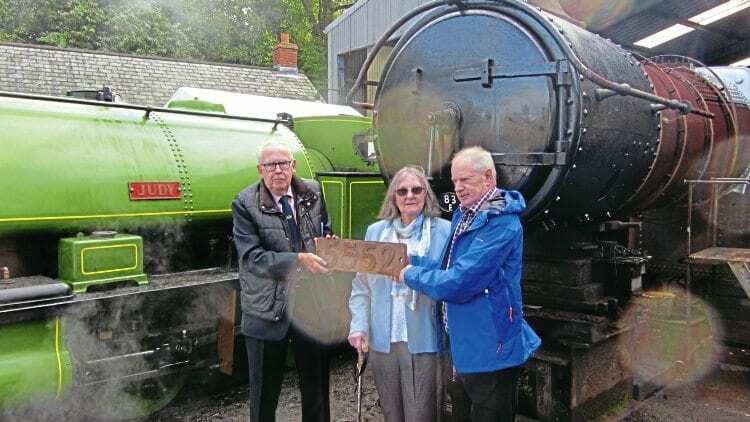 A spokesman for the Bodmin & Wenford Railway said: “The BWR would like to thank Marion for her generosity in reuniting steam loco No. 5552 with its original numberplate. Read more News and Features in Issue 234 of HR – on sale now!